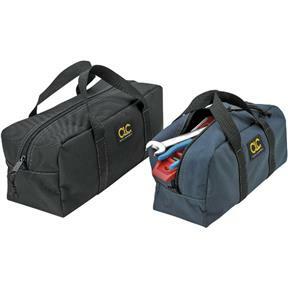 This popular utility tote bag combo is great for organizing small odds and ends, loose parts, hand tools, fasteners, and fittings. Reinforced bottom panels with strong web carry handles. Separate and organize your small parts and hand tools. Large bag is 14" L x 5-1/2" W x 6" H, medium bag is 12" L x 4-1/2" W x 5-1/2" H. Tools not included.